The Digital Millennium Copyright Act is an important document to protect the interest of a website and the content displayed in there. Even though people know that it is not right to do simple copy past of website material, there are still plenty of them doing that. 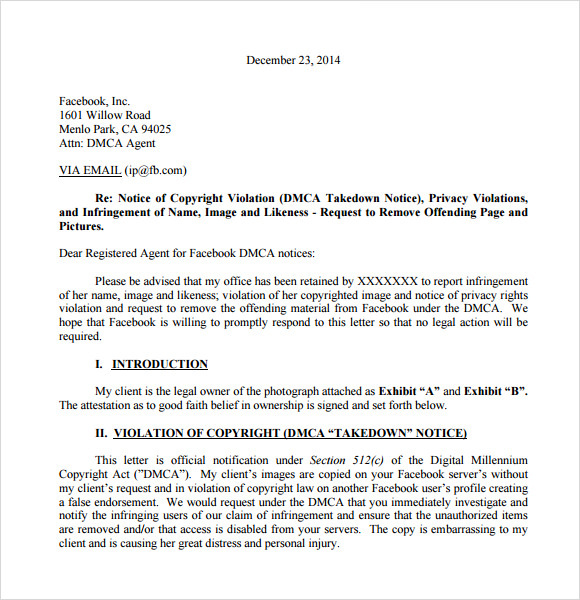 You can use DMCA notice template to make such a letter. You may like Sample Notice Letters. Owners of a Copyright Notice material can give notice to the webhosting company that contains the infringing material, and action will be taken almost every time. Free sample of various formats are available in here and you can download and use it to serve your purpose. 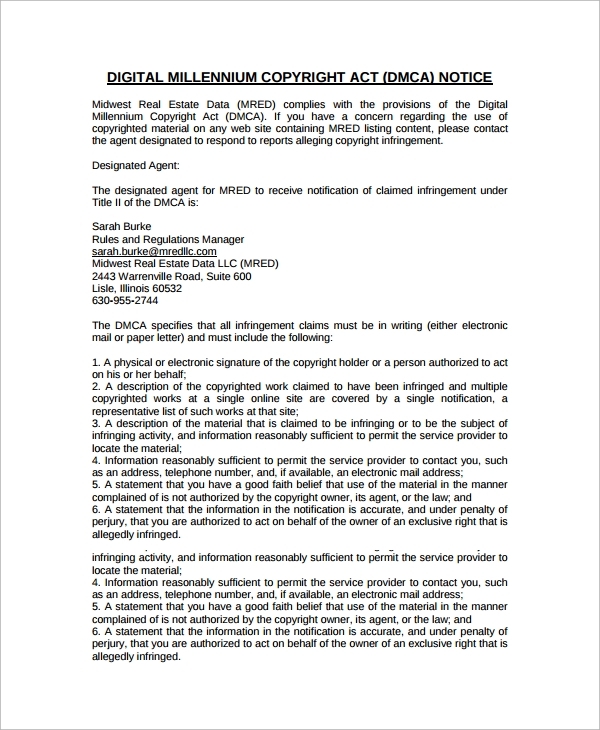 The Digital Millennium Copyright Act Notice Template helps you to enjoy unmatched protection from copyright infringement lawsuits. 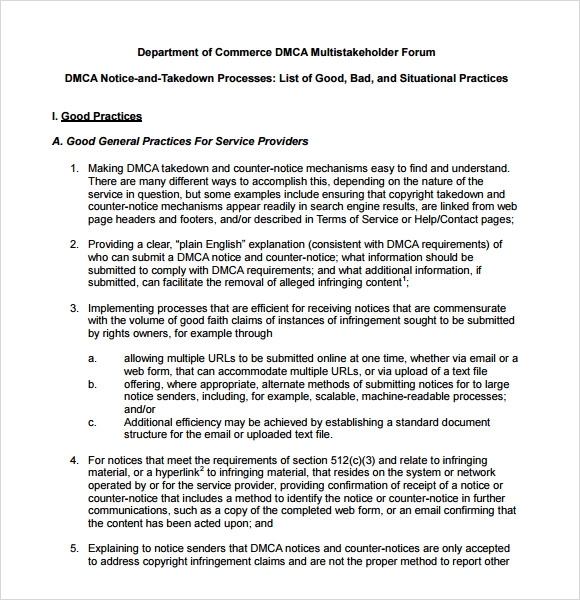 Ideal for web hosts, individual contributions, and businesses, all of these templates can be used to issue legal notices against usage of copyright material on the web. As the name suggests, the Claimed Copyright Infringement Notice Template enables web hosts, search engines and all the known internet services from copyright infringement claims. 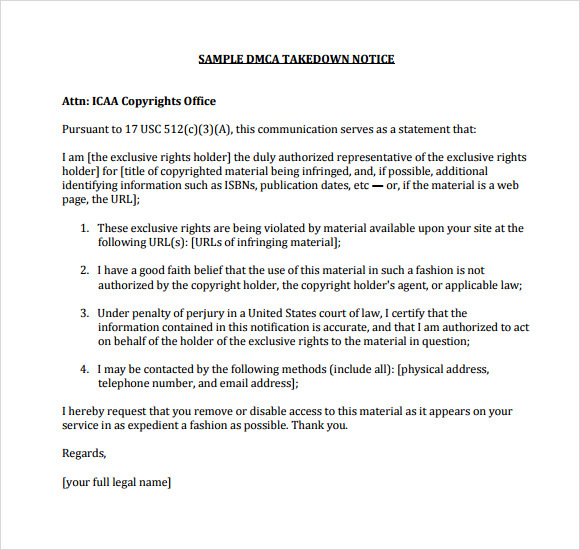 You can use these templates to request others for removal of infringing material soon after they get your notification. 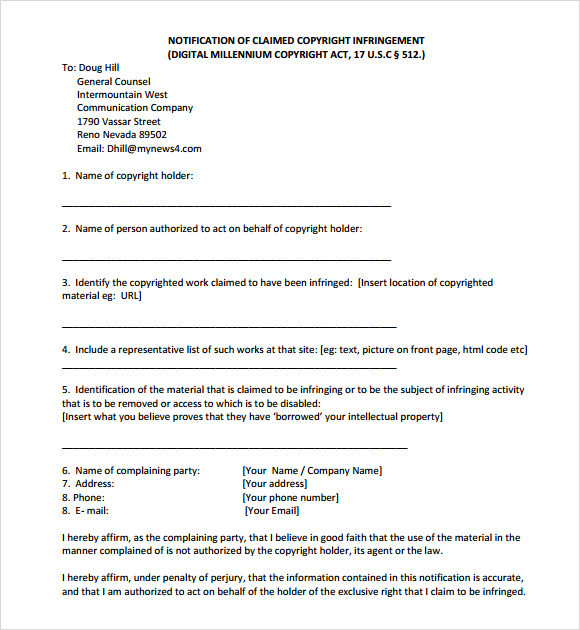 The Copyright Infringement Notice Template ensure that you get optimal credit for the work you’ve done and no one else can claim your hard work, just by copying it from the web. 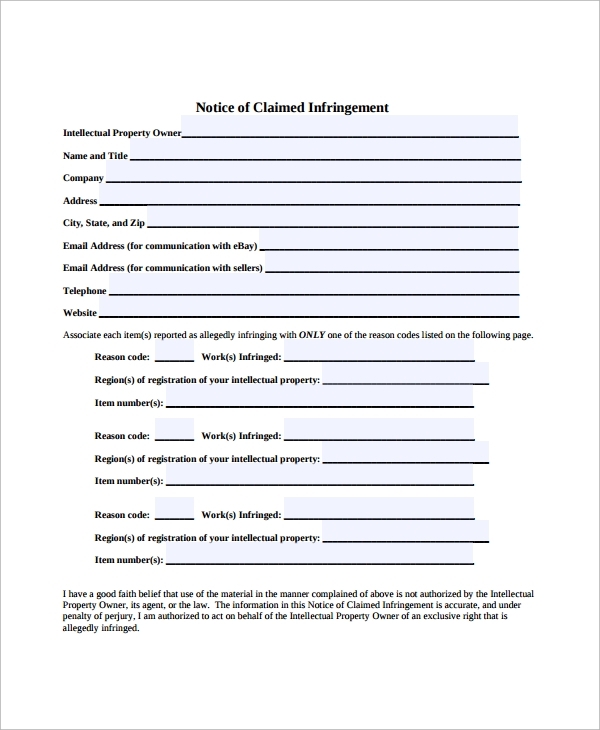 The template includes a detailed terms and conditions list to ensure that you file claim against usage of copyrighted materials. 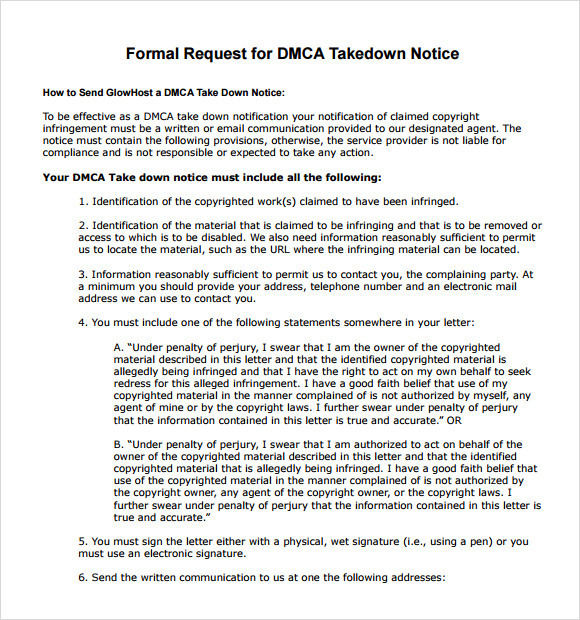 The DMCA Takedown Notice Template is specially designed and developed to help you send legal notices to the people, businesses, and organizations who have copied your copyrighted content. You can use these templates for asking credit about your personal work on varied blogs and web pages. Contacting your lawyers, seeking their advice, and then drafting a legal notice for claiming your copyrighted content can be quite challenging. These readymade templates come will all the essential things that one needs to mention in the Copyright Infringement Notice. You may also like Final Notice Templates. What All Does These Templates Contain? Coming with a lot of details and descriptions, all of these templates come with a pre-set format that includes name of the claimer, details of the copyrighted material, URL or location where the content has been used, and request for removal of the same or to provide credit to the actual contributor. You can also see Separation Notice Templates. 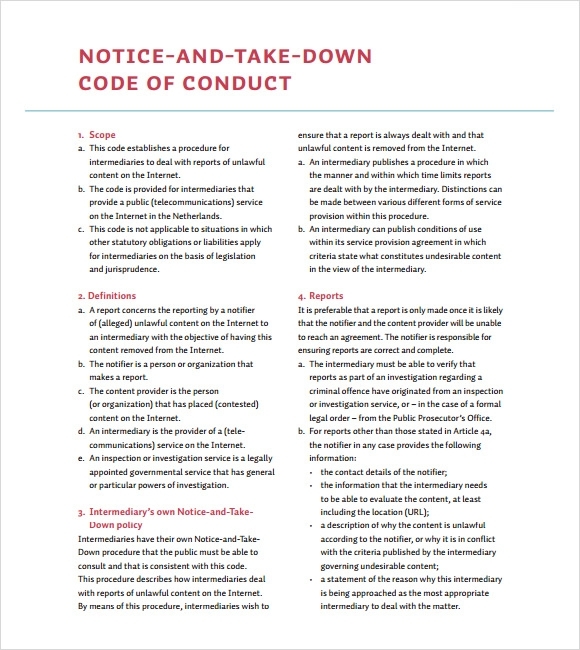 These templates contain all the necessary details that you’ll require to mention in order to request actions against unlawful, misappropriate, and misuse of your our original and creative work. Downloading and using these already made templates can save a lot of time, money, and effort. You may like Layoff Notice Templates. The template are ideal for usage in any industry, but you will require formatting the content or modifications will be required in order to make it relevant to the subject matter. The templates are ideal for sending professional legal notices.